The Cuban Missile Crisis was a military confrontation during the cold war involving the US, the Soviet Union and Cuba. It was arguably the point at which the cold war came closest to escalating into nuclear war. How would you have dealt with the situation if you were in the shoes of the US, Soviet or Cuban leader? Try to see it from different perspectives. Write a script: Read the timeline below and come up with a script for your role-play. You might also like to watch films such as Thirteen Days (2000) and The Fog of War (2003). Allocate roles: Who’s going to feature in your role-play? Think about who the key players were in the Cuban Missile Crisis. They might not have been in the public eye! Rehearse: Practise your role-play several times. See if you can modify it to make it even better. Be sure that you’re conveying events clearly. Ask someone to give feedback. Perform: Perform the role-play in front of your class. Encourage them to discuss the issues with you afterwards. What lessons can be learned from the Cuban Missile Crisis? 19 December 1960: Cuba officially aligns itself with the Soviet Union and its policies, prompting the US to end diplomatic relations. 12 April 1961: US President John F. Kennedy pledges not to intervene to overthrow Cuban president Fidel Castro. 17 April 1961: A group of US-backed Cuban exiles invade Cuba at the Bay of Pigs in an unsuccessful attempt to trigger a rebellion against President Castro. 27 July 1962: Castro announces that any direct US attack on Cuba would result in the equivalent of a world war. 10 August 1962: CIA director John McCone informs President Kennedy that Soviet medium-range ballistic missiles will soon be deployed in Cuba. 11 September 1962: In a speech to the United Nations, Soviet foreign minister Andrei Gromyko warns that a US attack on Cuba could mean war with his country. 14 October 1962: The United States obtains photographic evidence of missiles stationed in western Cuba. 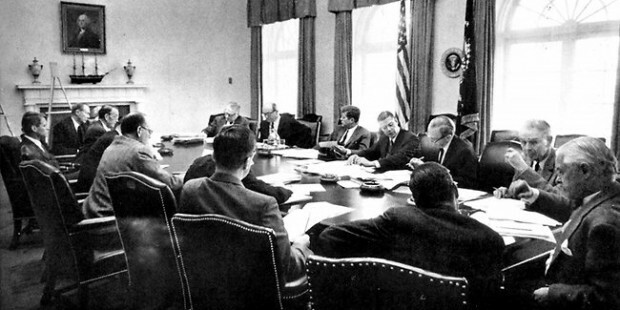 16 October 1962: Kennedy and his national security advisers meet to discuss diplomatic and military courses of action. 18 October 1962: Gromyko meets with Kennedy and assures him that Soviet weapons were given to Cuba only for the defence of Cuba. 20 October 1962: Kennedy announces in a televised address to the nation the presence of offensive missile sites in Cuba. 23 October 1962: Kennedy orders US ships to take up position 800 miles from Cuba and form a “quarantine line”. 24 October 1962: Soviet ships en route to Cuba either slow down or reverse their course – except for one. 25 October 1962: Kennedy sends a letter to Soviet leader Nikita Khrushchev laying the responsibility for the crisis on the Soviet Union. 26 October 1962: Khrushchev sends a letter to Kennedy proposing to remove his missiles on the condition that Kennedy would never invade Cuba. 27 October 1962: Kennedy agrees to Khrushchev’s proposal and the secret condition that the United States would remove missiles stationed in Turkey. 28 October 1962: Khrushchev announces over Radio Moscow that he has agreed to remove the missiles from Cuba.